One Ghana, One Voice: How Poems Work #2 - Dela Bobobee on Mariska Taylor-Darko's "The Deer Hunt"
How Poems Work #2 - Dela Bobobee on Mariska Taylor-Darko's "The Deer Hunt"
The following is the second installment in our "How Poems Work" series. This series aims to give OGOV readers and poets an opportunity to talk about some of their favourite poems previously featured on the site. Mariska Taylor-Darko's "The Deer Hunt" initially appeared on our site on September 25th, 2010, and can be read in full here. The poem “The Deer Hunt” showcases the Aboatyer Festival of the people of Winneba. Like most every other festival in Ghana in particular, and Africa in general, the tenacity of the people of Winneba to their indigenous mores is highly commendable. It is arguable that all African festivals based on rituals are underlain by an attempt to appease or conciliate somebody or something supreme (a deity). This is also known as propitiation, and it is the historical motivation for the Aboatyer Festival. In this case, the Otuano royal house, which is the custodian of the paramount stool of the Effutu state, observed this ritual once in a year. It is believed that in the past during periods of difficulty; the sons and daughters of Gyarteh Gyan Penyin and their descendants were greatly supported by a deity called Otu. History has it that in their quest for a suitable place of abode, they were guided by the deity on a long, tortuous and windy trail through forests and across rivers, down to their present location. In appreciation, a ritual sacrifice was made, which was meant not only as an act of gratitude but also as a consecration of the deity to renew its powers. At a particular time of the year, the people offered propitiation and sanctify the deity and its sons (the lesser gods) with human sacrifices. But as time went by the human sacrifices were replaced by the “wansan” (deer). Nowadays, active preparation towards the festival starts soon after the Easter holidays. Since 1965 the date has been permanently fixed for the first Saturday in the month of May. The Asafo companies consult their shrines for clearance, protection and early catch during the week preceding the festival day. The Tuafo invoke their gods on Wednesday and Thursday whiles the Dentsefo invoke theirs during the week apart from these two days. The gods are invoked indoors between noon and sunset. 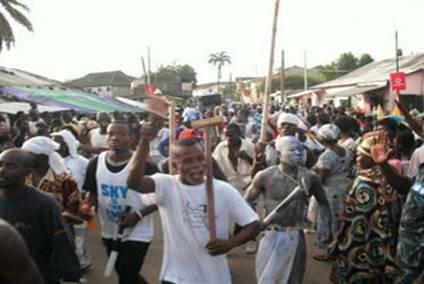 On Friday, the day proceeding the hunting day, both Asafo companies parade through the town on some selected streets. The capture of a live deer needs many hands and hence the involvement of the militia or “Asafo” hunters’ groups. It was from this point on that the annual sanctification and appeasement became a public affair. The “Asafo” in Winneba was developed from the local militia initially established by King Bondze Abe. This later became the Tuafo “Asafo” No.1 company. Later his successor and son created the Dense “Safe” No.2 company. It is recognized that the creation of the second Asafo company began the competition and rivalry between the Asafo companies. The competitive spirit made each group eager to bring home the first catch which the needed for the annual sacrifice. This was what gave birth to the Deer Hunt or “Aboatyer” festival. Based on the general festive depiction of this poem, there can be several levels of interpretations in terms of the contemporary significance of holding fast to one’s cultural heritage. But in my opinion there are some other equally important themes surrounding the uniqueness of Aboatyer Festival in itself. At first glance, the thematic preoccupation of the poet would appear to be a simple showcase of one of the most popular festivals in Ghana, by using the point of view of a child narrator. This would perhaps easily mislead the reader to regard it as only an occasion of great fun and childish fascination recollected from the nostalgic memoirs of a Ghanaian poet who has left the shores of her native country at a tender age. But in terms of the real cultural significance of the Aboatyer Festival of the people of Winneba, the cogent themes derived are the adaptation of ancient rituals based on compassionate grounds as ethical tenets of humanity, freedom and justice. There are also the themes of reunion and royalty (the significance of the particular family house of the narrator being chosen as the ceremonial converging point for preparation, for the hunters to wear their gears and get ready for the task ahead, and the women to cook for the feast; perhaps means that the narrator comes from a regal lineage of some sort). The poem’s third stanza also showcases to the world and the uninitiated some mouth-watering typical Ghanaian delicacies which bring some thrilling gustatory images to the reader’s mind. As we can all rightly affirm from the backdrop of its antecedence, facts reveal that the previous ritual of human sacrifice associated with this festival has been completely erased and successfully replaced with the symbolic sacred deer that must be caught live without the use of weapons. Yes, this goes a long way to say that society is dynamic and so from time to time it reviews and adjusts its cultural practices to reflect its evolving humane ideals. In other words, the poem has entrenched within it the universal theme of human compassion. This also demonstrates that not all of our indigenous African mores or traditions are fetish and heathen as others unfamiliar with our socio-cultural inclinations would make us to believe. The deer represents a redeeming status in terms of a human life, just like the ram replaced Isaac as an object of sacrifice in the biblical account of Abraham’s obedience to God’s directives. Other significant themes of the poem include hunting prowess, heroism, unity, peaceful coexistence, harmony, the adherence and preservation of the rich cultural heritage of the traditional African people. One of the most magical elements of this poem is the fact that the ceremony being showcased is narrated through the point of view of a child. For this, I give Mariska a plus for exceptional artistry and an apt choice of point of view. Her choice of a child narrator gives the poem a peculiar tone of good cheer, simplicity and festivity. The imagery created by the words of the child narrator evoke an atmosphere that is a mixture of tension, relief and celebration. Perhaps what makes the poem “The Deer Hunt” exceptional is the clever use imagery, the pictures the poet paints in the mind of the reader. Imagery in poetry is what the words of the poem make the reader 'see' in their imagination. It is the colours, sounds, and sometimes feelings evoked by the poem. Mariska’s smart use of imagery intensifies the impact of the words of her poem as she “shows” us with her words, rather than just “telling” us what she feels. To put the matter concisely: imagery is the content of thought, where attention is directed to sensory qualities: mental images, figures of speech and embodiments of non-discursive truth. Psychologists identify seven kinds of mental images — those of sight, sound, taste, smell, touch, bodily awareness and muscular tension. All these imageries are available to poets, and are used by poets, though rarely to the same extent as Mariska uses them. The effects Mariska achieves are various. She uses imagery to externalize thought, create mood and atmosphere, develop plot, and increase dramatic effects by abrupt changes in imagery. She achieves all this in a very clever way. Let me use an example to explain this. When I mention the effect achieved to develop plot or increase dramatic effect by abrupt changes in imagery, I mean that the poet gives a surprise attack on our emotions: all along she makes us think something different but at the last minute she quickly switches imagery to show us a different scenario. Well, that is what I call clever, isn’t it? Dawn was creeping in when the hunters assembled. To a young child like me. What are the images of combat, gore, violence, bloodshed, death, etc? They are sticks, guns, cutlasses, bows and arrows. But the surprise comes at the end – “Did our men catch the elusive deer!” Yes, they did. The men “caught” the elusive deer – live (without recourse to any of the kind of weapons listed). In the first three lines, the reader is made to believe that the speaker is describing a sleeping baby. But at the fourth line, this understanding is shaken. The baby is covered, not by a blanket, but by earth. That is, the baby is dead. This realization can produce a sharp emotional reaction, an almost physical pang. And this effect on the reader is the "work" that this "machine of words" is designed to do. Although this poem is not humorous, its "mechanism" is akin to that of most jokes: a sudden alteration of perspective produces an immediate and visceral response. Other literary techniques, such as metaphor, simile, allegory, personification, metonymy (attribute for whole) and synecdoche (part for whole), all involve imagery. Often the things compared are both images, but one of them may also be a feeling or concept. For example, in stanza nine, apart from gustatory imagery in the first sentence below, which other type of imagery is used in both quotes? Simile: a figure of speech in which one thing is compared to another, typically using the word “like” or “as”. The playful children portrayed in a party mood are being likened to chicks, and their busy mothers lashed out with sticks when the children went near the food. It should be noted that while Mariska makes frequent use of the various types of imagery mentioned above, she also made sure she does not overuse them. How does she achieve that? She avoids employing any unnecessary clichés that might weaken the overall effect. The imagery comes naturally, and aptly achieves the intended effects. ﻿In the poem “The Deer Hunt”, Mariska paints pictures in the reader’s mind through the use of literary techniques, simple descriptions and a vivid narrative. As shown above we can see that in her use of imagery in the poem, the poet has been very careful not to mix metaphors too wantonly. Shakespeare did that, but we all know that fashions change because society is not static but dynamic. The overall intended effect is brilliantly achieved. How? She uses images that are new-struck and rich. Today, the Aboatyer Festival of Winneba can truly be regarded as one of the most popular and spectacular festivals in Ghana in terms of the ever increasing number of tourists that throng yearly to witness it. It is my hope that Mariska Taylor-Darko’s poem “The Deer Hunt” will go a long way in helping to also give the deserved publicity and exposure of the festival beyond the shores of Ghana. On the symbolic level it represents other themes which can be regarded as more complex. The circumstances surrounding the symbol of “wansan” (the Deer) is socio-cultural in nature, an ancient ritual of propitiation as deep as the mystery of earth itself. 1. Del Tufo, J. P. (1965) What is Poetry? Publication Office: Ateneo de Manila University. 2. Drew, E. H. (1933) Discovering Poetry. New York: W.W. Norton & Co., Inc. The photographs used in this essay are by Kofi Nyan Amoako of Winneba, and are used by permission of the photographer. Dela Bobobee is a frequent contributor to OGOV. You can read more of his work here. You make poetry sound lively in this groundbreaking essay of deep knowledge. There is always something very unique about your comments: very brief but intense. I equally have deep respects for you for being this insightful. This particular one is deeply piercing and concise. However brief it may appear, it does not sacrifice brevity for depths. This is one of the marks of every great literary critic. It reminds me of the popular ones I see on some blurbs from typical New York Times Book Review critics commenting on literary masterpieces. Now, coming to the poem in question, “The Deer Hunt”. Like I said earlier, it has an empirical theme of propitiation, which is universal to all human cultures. The poem and the essay both came at the right time to coincide with the Eid-el Kabir festival of Muslims all over the world. Yesterday and today is the Eid-el Kabir where Muslims mark their symbolic religious propitiation. Prior to yesterday, which marked the beginning of the festival many Muslims have thronged to the markets in search of rams to sacrifice for the occasion. Eid al-Adha (or "Festival of Sacrifice" or "Greater Eid") is an important religious holiday celebrated by Muslims worldwide to commemorate the willingness of Abraham (Ibrahim) to sacrifice his son Ishmael (Isma'il) as an act of obedience to God, before God intervened to provide him with a ram to sacrifice instead. The meat is divided into three parts to be distributed to others. The family retains one third of the share, another third is given to relatives, friends and neighbors, and the other third is given to the poor and needy. The word “Eid” in Arabic means 'solemn festival'. Yesterday in Lagos it was really very wonderful experience. There was a heavy downpour of rain and towards the evening it subsided into trickles of light showers. There were happy faces of the Muslim celebrants dancing and jubilating in the rain showers. The reason, the rain signifies the acceptance of the sacrifice and also spiritual cleansing. Yes indeed, in Africa Traditional Religion (ART), and perhaps in all human cultures, rainfall after a sacrifice is a sign of acceptance of the sacrifice, sanctification and reconciliation. 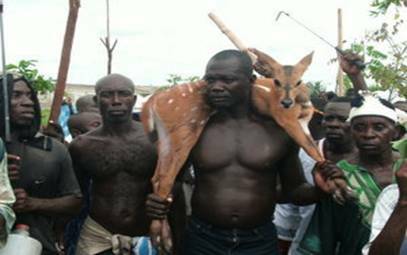 What relevance does all this has to say in relation to the “Deer Hunt” or Aboatyer Festival of Winneba? They both share the themes of covenant sacrifice and spiritual sanctification. Don’t be surprised or confused at the similarities in this concept even when viewed with the perspective of Islamic, Christian, Jewish, and African Traditional Religion (ATR). They are all the same, inspite of the erroneous strict stance of the early snobbish Christian missionaries who first came to Africa and unwittingly committed a farce by labeling all African indigenous practices and festivals as fetish and heathen. Anyway, that was their own undoing; the astute Islamic missionaries on the other hand did not do that. What was the result? Most Africans saw the similarities and unconditional acceptance of Islamic practices and clung to it. Too late, the uptight Christian missionaries scooped only a few new converts in the “uncivilized nations” of the world. By the way, before the so called western civilization came who said Africa was uncivilized? Look, both the Jews and the Muslims are Arabs from the Middle East and come from the same root, Abraham. That is where these three great world religions originated from. What of the non-Arabic Christians and Muslims? We are all metaphorical descendants and heirs of the Abrahamic covenant. And so, what is this fuse all about anyway? thanks Dela for your wonderful critique of Mariska's poem. Poems written from a child's POV have always been powerful, sometimes with an understated hint of menace. Think about Blake's Songs Of Innocence . It may be good for the men, women and children, but certainly not for the deer. It has to die to ensure that the community survives for another year. It is not amusing to be in the position of the scapegoat. LS, yes you are right when you expressed sympathy for the poor deer that has to die to ensure that the community survives for another year. Indeed, it is not amusing to be in the position of the scapegoat, like you said. But the symbol of the deer in the Aboatyer Festival here is far, far deeper than that. I know you wouldn’t by any chance have preferred the preexisted human sacrifice instead, just as you wouldn’t want the most spectacular and famous Aboatyer Festival to be scrapped out entirely. Without the “wansan” there would be no Aboatyer Festival as well. The kind of deer used in the Aboatyer Festival ritual is a special specie. Africa has only one native species, the spotted Red Deer. This means that it doesn’t come by easily. It is highly illusive and like gazelles, it is also known for their speed and leaping abilities. It has long strides and can run with lightning speed. Apart from moving very fast it also can pick through dense foliage and dive into the shadows rapidly to evade capture. All this require exceptional tracking and hunting skills. I bet ya, both the champions and the unlucky competitors would definitely sweat it out to capture one for the festival. Man’s strong will always smothers all the trials and emerges triumphant at end. The deer must give its life for the sake of the entire community. But the good news is that, the sacrificial deer does not lose its life, rather it regains it in death. There is a delicate balance in the magic of life because of its interrelatedness. From the crawling ants to the leaping antelopes there is connectivity. For instance, we eat the deer as food but when we die we turn into grass and the deer feed on it. Anyway, that was the same feeling I had at Paga Chief Crocodile Ponds sometimes ago. A fowl was offered to giant Nile crocodiles as a ritual for tourists to take photographs with the crocs. And I asked myself, what is the fun or point in one life (fowl) being wasted for a chance to take photographs with a croc. It does not make any sense to me. But I was wrong; it does make sense after all. Perhaps if you read my free online travelogue “The Last Journey”, you would understand why so. The Symbol of “wansan” – The deer. What is so special about the circumstances surrounding the symbol of “wansan” (the Deer)? There is something very fundamental and unique about the symbol of the deer in Aboatyer Festival in particular, and Africa in general. It is its spiritual significance. The spirituality of that particular deer specie has always been considered by Africans as very special. The earth itself was created on that same tenet of a redeeming status. “For God so loved the world that He gave His only begotten son …” (John 3:16) And so, for you and I to live a life must be lost, just like the deer’s. This is another interesting part of the symbolic level of the deer. Why is it that the deer skin drum is highly preferred (globally) for some special kinds of rituals and occasions? Fusing of the dead to animate the living. In my native Ewe language we say, “la kuku le gbe dem wu agbagbea.” It is literary translated as – “a dead animal sounds louder than when alive”. It is the spirituality elements of fusing the dead membrane stretched over a hollow wood to evoke a cosmology as deep as the magic of life itself. The spirituality of the deer can be seen in other religions, folklores and mythologies of the world: not only African but also Celtic, Christianity, Islam, Judaism, Hinduism, Greek, Germanic, Ottoman, Hittite, occultism, Scythian, Slavic, Huichol, and Shinto etc. If many who would read Mariska poem, Deer Hunt would love it they would love to participate in the festival after a thorough read of Dela's appreciation of the poem. Dela's critique can be in any book for academic work. I reckon that intelligence is not a privilege; it is a gift that must be used for the benefit of humanity. Yes, indeed Mariska Taylor-Darko has done a very brilliant work with her poem “The Deer Hunt”, and so any other work of consolidation that would help give further spotlight to the Aboatyer Festival of Winneba would be just wonderful. The glory would not go only to the poet or peoples of Winneba but would be equally shared by all Ghanaians, and all Africans. A special credit also goes to the OGOV crew and regular members like you and other participants in this laudable ideal. A nation without its own unique culture is a nation without a history. Our culture is the totality of our idiosyncrasies. It is the cumulative deposit of our traditional knowledge, experience, beliefs, values, attitudes, meanings, religion, notions of time, roles, spatial relations, concepts of the universe. This is what we have acquired over generations through our collective motivations. Therefore, any nation without its own unique culture would lose track of its present realities and jeopardize its potential progeny. This is so because the African worldview is one unique cosmology entrenched on the cyclical concept of time. To us Africans, the concept of time is not linear. That is why we must promote, protect, maintain and preserve our native culture. Special kudos to the peoples of Winneba. Congratulations to this year’s winners of the competition to be the first to catch the illusive wansan. Finally, a special appeal to all stakeholders to ensure a continual crisis-free celebration of this special festival. Thank you all for the good work you have doing. I noted earlier that poems written from a child's perspective or intended for children always have some dark underbelly, even if that may not have been the poet's original intention. Maybe all of this is outside the scope of the poem anyway. And no, I'm not advocating for the plp of Winneba to return to human sacrifice, nor do I advocate that their festival be abolished. If it changed, it can change again. Since you mention festivals from other cultures, the Christian Easter is also propitiatory, the difference here is that the sacrifice was made once, and every year the adherents go through the motions of commemorating it. It takes nothing away from them, at least not as far as they are concerned. As for those who go to watch the Aboakyer festival, it could just be that the Central Region happens to be the site of our two famous former slave Castles. The spectators could also be there for the spectacle as well as the carnivalesque elements. They don't care whether some poor animal was hunted down to ensure the community's survival for just another year. I keep thinking that the hunting may have more to do with the fact that there came a time when someone had to find a way to dissipate the energies of the militias when there were no more wars to fight. I have no evidence for this, though the words Asafo and Asantefo share the same root in that they both refer to people who fight; one to the fighting group, the other to an ethnic group. Perhaps the Akans among us can clarify this. Nobody wants an idle warrior in their backyard. He may just turn that aggression on those he used to protect. There really was a reason all the King's horses and all the King's men, couldn't put Humpty Dumpty together again. Hilariously amusing… LS go kill me with this Humpty Dumpty laughter o! LMAO! However funny it may sound, I still find some basic truths in your last comments. I come from Battor in the Volta Region. It is also interesting that the Ewes also call their native warriors as ASRAFO. I was told that the correct spelling should be Aboakyer and not Aboatyer. Thanks for the correction. It is a reality that nobody wants an idle warrior in their backyard for they may likely just turn that aggression on those he used to protect. But there are similar cases of hostility even when it comes to anything that has to do with not only combatants but other competitions like sporting activities. I remember back in those days when my village’s local football team would beat up any visiting football team that carry the day. Even if they won the match of the day they dare not jubilate openly else it would be taken as an assault on their hoary prowess on the green pitch. Yes, I guess it is ubiquitous since some people just cannot lose gallantly. Apart from the deer hunt and grand durbar, there used to be some other spectacular side attractions to kick off the celebration; like boat regatta between the fishermen groups, marathon race, football gala matches and crowning of Miss Aboakyer, the year’s winner of a beauty pageant. Another thing that may spoil the hitherto harmonious ancient ceremony is the obnoxious issues of chieftaincy disputes. It nearly did that in the past to our own Hogbetsotso / Asafotu Festival of Battor traditional area, until the youths decided to no longer meddle and support such unnecessary divisive clan feuds. Coming to the Aboatyer Festival, it is also rather disheartening to read about recent violent clashes during the festival which if not properly nipped in the bud would mar this popular ancient festival. There were reported cases of some sorts of hostilities during the most recent Aboatyer Festival in May this year. During the usual period of parading that precedes the hunt, the two rival groups clashed along a major street in the town. The Tuafo No. one and Dentsifo No. 2 Asafo Companies clashed at Ntwatanan and threw missiles and other offensive objects at each other on that Friday evening, resulting in injuries, and some people were arrested as the ring leaders of the fracas. As a result of fracas a durbar to climax this year’s Annual Aboakyer festival by the chiefs and people of the Effutu Traditional Area could not take place mainly due to insecurity and the mounting tension in the Municipality. 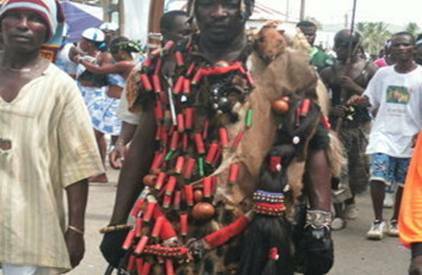 The Omanhene of the Traditional Area, Neenyi Ghartey VII, made this known to the Ghana News Agency (GNA) in an interview in Winneba. According to him as at 0700 hours on Saturday, the two Asafo Companies Tuafo and Dentisfo No. 2 had still not gone to the bush to capture the live deer, for fear of being attacked, following a clash between the two on Friday evening in which about ten people were injured. Please I therefore, wish to use this opportunity to appeal to all the youths of Winneba to desist from any further hostilities. This grand ceremony that was bequeathed to them by our sane ancestors should not be allowed to lose its former glory. They should rather pool their positive energies to things like community development projects and conservation of the surrounding forests which were former ideal habitats of the Red Deer wansan. It is recorded that in May 2001, there was no deer for the propitiation ceremony termed, “Millennium Aboakyer Festival”. At exactly 6 a.m., the two Asafo groups, the Dentsifo Number Two and Tuafo Number One, clad in their colourful traditional attire of red and orange, and white, black and blue respectively, set off into the wild, wielding sticks, tree branches, among others, to search for a catch. Barely four hours after the Omanhene and his guests had sat in state awaiting the catch from either of the two groups; the Tuafo arrived first, followed by the Dentsifo, at the durbar grounds only to inform the Omanhene of their inability to get a catch for sacrifice to the gods. In the absence of rituals which are normally performed with the catch from either of the two Asafo groups, the Omanhene left the grounds in disappointment to prepare for the next stage of the festivities, the procession. Please don’t any question on the implication of the inability of the two Asafo companies to have a catch. Just as the Omanhen said, the implication is something that cannot be discussed. I also wish to appeal to the Ghana Tourism Board to assist in such community development projects of this area to attract more tourists. The Ghana Government and private individuals too can help a lot especially in building adequate student hostels in the area to complement the accommodation efforts of the local residents who complain of students taking over most of their houses. Anything good that can ensure peaceful coexistence and foster hitch-free future Aboakyer Festivals is highly welcome. Thanks.